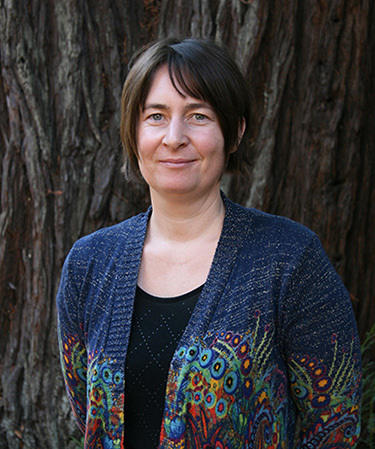 The Alfred P. Sloan Foundation has awarded a Sloan Research Fellowship to Alexie Leauthaud, assistant professor of astronomy and astrophysics at UC Santa Cruz. The prestigious two-year fellowship includes a grant of $65,000 to support Leauthaud's research, which focuses on understanding the connection between galaxies and dark matter. Awarded annually since 1955, the Sloan Research Fellowships honor early-career scholars whose achievements mark them as among the very best scientific minds working today. Leauthaud's specialty is the phenomenon of "gravitational lensing," in which the gravity of a galaxy in the foreground of an image bends the light from a more distant galaxy as it passes by. Gravitational lensing can be used to measure the mass of the foreground galaxy, including the invisible mass of the galaxy's dark matter halo. This invisible and mysterious dark matter accounts for most of the mass in the universe and serves as the scaffolding upon which ordinary matter forms galaxies, stars, and planets. Leauthaud's group plays a leading role in the "HSC Survey," an unprecedented effort to collect the most accurate data in the world to measure gravitational lensing using the Hyper Suprime Camera on the Subaru Telescope in Hawaii. She leads the galaxy formation working group and co-wrote the proposal that was awarded 300 nights of observing time on the Subaru Telescope to collect the data. "I will use these data to characterize the link between galaxies and dark matter, to study dark energy and the theory of gravity, and to provide robust constraints on the parameters of the standard cosmological model in ways that were not previously possible," Leauthaud said. Previous studies of dark matter revealed discrepancies between different data sets that may point to new physics, she said. New data from the HSC Survey and her expertise in gravitational lensing put Leauthaud in a unique position to address some of the most fundamental questions in physics as well as to understand the connections between galaxies and dark matter. Leauthaud earned her M.S. at the Institute of Astrophysics in Paris and her Ph.D. at the Laboratory of Astrophysics in Marseille, both in astronomy, astrophysics, and cosmology. Before coming to UC Santa Cruz in 2016, she was a researcher at the Kavli Institute for the Physics and Mathematics of the Universe in Tokyo. The Sloan Research Fellowships are awarded in close coordination with the scientific community. Candidates must be nominated by their fellow scientists, and winners are selected by an independent panel of senior scholars in their field. The fellowships are awarded in chemistry, computer science, economics, mathematics, computational and evolutionary molecular biology, neuroscience, ocean sciences, and physics. The Alfred P. Sloan Foundation is a philanthropic, not-for-profit grant making institution that supports original research and education in science, technology, engineering, mathematics, and economics.